I’m going to deviate from writing about my life today and put out a plea for any and all U2 fans to help me with a simple request. I’m looking for other fans, bloggers, music enthusiasts, people who have met or been helped by, and people with faith and love in their heart that have been influenced or changed as a result of listening to the music of U2. If this has happened to you, please send me your story, any concert or personal pics (all appropriate credit given to pics, so please let me know if you or someone else took them) and whether or not you would mind if I share your story with others. I am ultimately hoping to write less about me and connect with other fans and hear their experiences in more detail than Facebook currently provides. I see lots of picture and video sharing, but I’m really interested in how U2 has inspired other fans. Has their music inspired you to make changes in your life, join the ONE campaign, get involved in charity work, etc? Really hoping to hear some comments or stories! This site is in it’s “infancy” so please be patient; I will be sharing! Thanks U2 fans! Thanks U2! U2ARELOVED! I took lots of pictures 2011’s 360 tour when I saw them in Baltimore, MD and Philadelphia, PA. This was taken in Baltimore. I was inside the circle and very close to where they walked around. Of all the pics, this was my favorite. 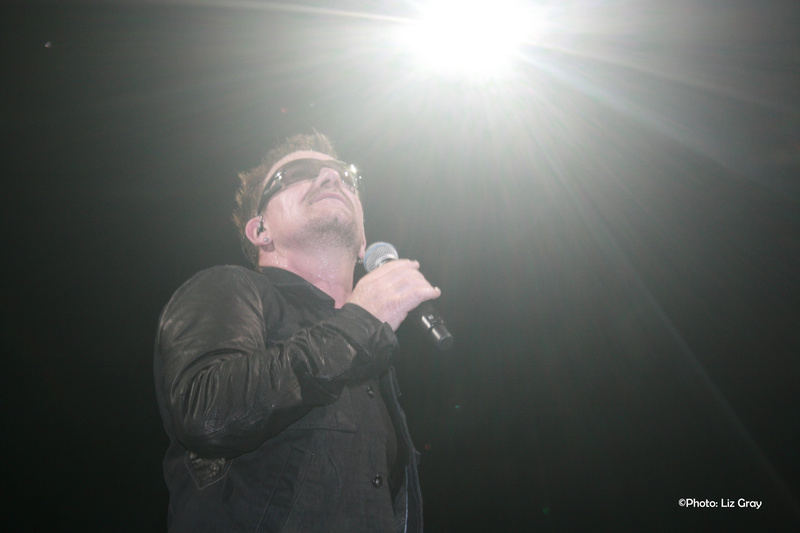 Bono really does seem to walk in a very special light indeed. sono felice di poterti mandare la mia storia. Ma DEVO MANDARLA IN ITALIANO..
WOW, this will take some time for me to think about how I’d want to write it out. I became a fan when I was around 12, so I feel like I’ve pretty much grown up with U2. They permeate every aspect of my life in some little way. Part of who I am is definitely influenced by U2 and they’ve been “with” me through my most trying and joyous times. I hope you get lots of responses from fans who have been touched in the same way. U2 is not merely a band. They are a way of life! U2 helps me to see faith with feet. I can see how God has moved their hearts to help others, and it inspires me to have more active compassion also.